Tayloright LLC (dba Mens Wedding Bands) is one of the largest volume dealers for Triton products on the internet. One of the reasons our online store is a volume seller for Triton is that our prices are far less than the retail stores - we simply do not have their overhead and therefore we do not need to mark up the products like the brick and mortar stores do. Mens Wedding Bands was selected and approved to sell Triton products online and we have been delighted with their stunning designs and commitment to excellence. Design flaw or defect? No problem, we will get you a new ring! Sizing problem? No problem we will get you the right size. For life! 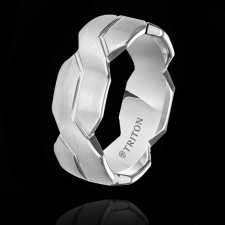 All of the Mens Wedding Bands precious metal rings including gold, platinum, and palladium are also made for us by Triton. Triton - the world leader in handcrafted, stunning, lifetime designs.